Amelia Eisenhauer on the American Idol set...and soon at the Cine in New Albany. NEW ALBANY – The stars have aligned to bring two great events to New Albany this weekend. Coincidentally, both events feature nascent talent. On Friday night this talent will be in the world of music and on Saturday, the talent will be in the world of sports, particularly Basketball. At only 16 years, and already named a YoungArts Merit Award Winner, Amelia Eisenhauer, the lead singer and violinist for The Eisenhauer Band has been making waves in the Nashville young creatives scene since she, her mother and brother, moved there several years ago so that she could pursue music. Last year she was recognized by the YoungArts Foundation, a national organization which “identifies and nurtures the most accomplished young artists in the visual, literary, design and performing arts and assists them at critical junctures in their educational and professional development.” YoungArts alumni who have become leading professionals in their fields include actors Vanessa Williams, Viola Davis, Kerry Washington, and Adrian Grenier; Chief Executive Officer of American Ballet Theatre Rachel Moore; recording artists Nicki Minaj and Chris Young; Metropolitan Opera star Eric Owens; musicians Terence Blanchard and Jennifer Koh; choreographer Desmond Richardson; visual artist Hernan Bas; and internationally acclaimed multimedia artist Doug Aitken. Local favorite recording artist Sam Mosley will sit in with the Eisenhauers for a few songs. 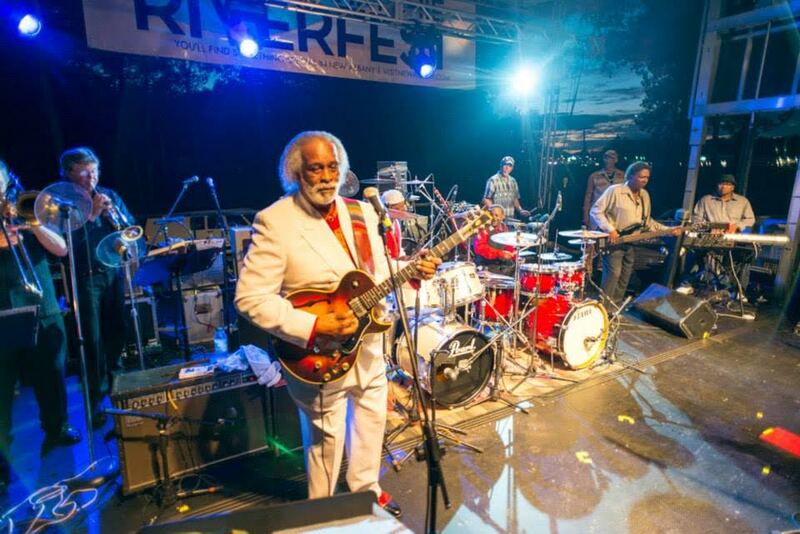 The band first played New Albany at the 2014 Riverfest and was well-received by those who saw her and has since come back to play at Down from the Hills, Riverfest 2015 and a number of private and ticketed events. The band, made up of Amelia (vocals, violin and mandolin), Rhonda (her mother, on vocals and guitar), her younger brother, Adam (banjo) and producer Bryan Ward (bass, percussion, guitar) is known for its unconventional and compelling takes on traditional standards. Add to that the chemistry inherent in a family band, and there’s just something magical there. Since first coming to New Albany in 2014, the band has continued working toward success in the music industry. This past year their worked paid off with Amelia being invited to participate on the final season of American Idol – her try out for the show will be televised on Wednesday or Thursday night this week, only a day or two before she performs at the Cine Theater on Friday night. Advanced tickets for the event are available at the UCDA offices (across from the courthouse) for $10. If any tickets are left by Friday, they will be available at the door. All tickets are general admission. To reserve a ticket, call 662-534-1047. “Showtimes at 7pm for the early show at the Cine and 9:30 for the late show (sold out for The Basement venue) will allow for folks to come to the shows and take in dinner in New Albany…our downtown eateries have a lot to offer and New Albany has such a beautiful downtown…we want to show that there’s something to do in New Albany on the weekends that is comparable, if not better, than what you could find in larger towns around the area,” says Sean Johnson of New Albany Tourism, who is helping coordinate the events. Then on Saturday morning, sports fans can check out up and coming basketball stars at the Kiwanis Hotbed Classic, which features players from five states taking to the courts at the middle school gym at 9am. This is the 25th year of the Classic which as presented a number of players who’ve gone on to make names for themselves in the big leagues, such as Erick Dampier of the Dallas Mavericks and Travis Outlaw of the LA Clippers. Some former NBA players include Justin Reed of the Boston Celtics and Jackie Butler of the New York Knicks. This year’s line-up includes a number of kids included in the Future 150, including John Petty – JO Johnson HS (2017 Future 150 #14), Alex Reese – Pelham HS (2017 Future 150 #29), Darius Hicks – 22FT Academy (2016 Future 150 #130), and Robert Woodard – Columbus HS (2018 Future 150 #21). Additionally, a number of these young players are already signed with top basketball schools. “I have been told by folks that follow High School Basketball that this is the BEST group of talent that has ever played in the 25 years of the Hotbed!” says David Goode who is helping to produce the tournament. This year’s event is sponsored by Rowan Family Dentistry who, according to David, have some exciting things planned for the day including a chance to win $25,000!! (See Rowan Facebook). The tournament will also will continue to have $100 halftime shooters. 2 for each game played……Layup, Free Throw & 3 Pointers. The event begins at 9am and admission is $8 for a full day of games. For more information about the tournament, visit hotbed.newalbanykiwanis.org. And for more information about this weekend’s events, and other events going on in New Albany, follow city tourism on Facebook at www.facebook.com/ilovenams. For a list of downtown restaurants and links to their pages, visit. www.visitnewalbany.com .